Lug nuts are small wheel fasteners that vary in shapes depending on types but they typically have a rounded or tapered end (seat). They’re made of chrome-plated steel but titanium or anodized aluminum lug nuts also exist as lighter-weight alternatives for racing cars. As wheel fasteners, they’re important parts of your vehicle because they keep the wheels attached to the hub. Sizes and models vary depending on your car model. Changing tires involves different types of lug nuts while stripped or damaged lug nuts can make removing the wheel a challenge so be sure you’re using the correct type for the wheel. Conical lug nuts are probably the type of lug nuts that you will see most often. They are commonly used in many different types of cars and other vehicles. You will be able to recognize them by their cone-shaped lug seats. Sometimes, people also refer to these lug nuts as acorn lug nuts because they bear a striking resemblance to the shape of acorns. Whatever you want to call them is fine, so long as you are familiar with them and are able to identify them. You may also hear these lug nuts being referred to as tapered seat lug nuts due to the seat tapering down and becoming thinner. These should be remarkably easy lug nuts to work with. You won’t have a problem installing them properly so long as you have purchased the proper sizes. One important thing to note is that there are many lug nuts that are meant for after-market wheels only. If you are looking for lug nuts for factory wheels, then you should ensure that you are buying the right sizes so that everything can fit properly. For everything to operate safely and efficiently, you need to fasten the lug nuts right. Putting the lug nuts on properly and ensuring that you have the right lug nuts for the job will ensure your safety. 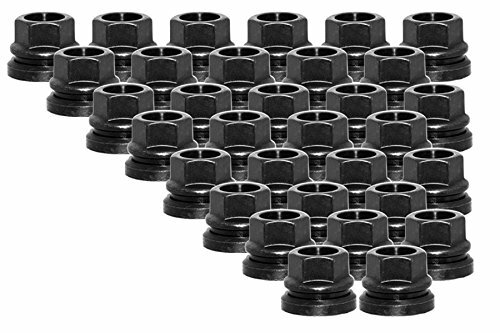 The lug nuts being shown here are a pack of 20 conical lug nuts. These are meant for after-market wheels and are not designed for standard factory wheels. They are a durable option for people who are looking for conical lug nuts for their wheels. You must ensure that your wheel studs do not stick out past the wheel more than 40mm for these lug nuts to be a viable solution for you, though. They are closed-ended lug nuts that will work nicely in the right wheels. Being able to buy a pack of lug nuts such as this can allow you to take care of all of the wheels on your vehicle. It’s a convenient option for taking care of everything that can keep you from having to shop around at multiple places. You will want to ensure that you have a 19mm hex wrench to get the job done right, so be advised. Spherical lug nuts are also pretty common sights when you are working on cars. They aren’t always referred to as spherical lug nuts, though. These types of lug nuts actually wind up having many different names. This kind of adds to the confusion of picking out the proper lug nut that you need, but it shouldn’t be too hard to grasp once you know what you are looking for. Other names for spherical lug nuts include ball seat lug nuts and wheel nuts. The example that is being shown here refers to the lug nut as a wheel nut. The defining characteristic of this type of lug nut is that it has a spherical seat. The head of this lug nut will actually look quite similar to the conical lug nuts mentioned above, so you have to differentiate it by looking at the seat. This rounded lug seat design is going to be perfect for many tasks. You will find many cars and other types of vehicles that use these spherical lug nuts. They are pretty simple to work with and you should be able to get used to using them quickly. They will be among the most common types of lug nuts you will encounter, so it will be good to be able to differentiate between spherical lug nuts and conical lug nuts. These nuts are really easy to install, so you should be able to make short work of your job. They will require a 19mm wrench to get the job done. You won’t need a wheel lock key, a washer, or anything else to properly install these lug nuts. It is a basic lug nut that does its job very well. Mag seat lug nuts are an interesting type of lug nut. When you are looking at one, you should be able to tell that they are a bit different right off of the bat. They have an extended thread which can be very convenient for several reasons. The other notable characteristic of these lug nuts is that they have a flat washer seat, making them sit very flush to whatever they are being installed in. Sometimes mag seat lug nuts will come with actual washers as well. The lug nuts that are being shown here are a good example of this. There are 20 different lug nuts and they come with 20 washers to use with each nut. You place the washer against the lug nut and then fasten it into place properly. Some lug nuts will come with the washer built in and others will not. It doesn’t really make a big difference either way. They will be just as convenient to use with a normal flat seat or an included washer. If you have a preference, then you can seek out whichever is going to appeal to you the most. One thing that confuses many people is why these lug nuts are referred to as mag seat. Many people assume it would be more sensible to call them something else that gives you a better idea of what they are. The answer to this is that these lug nuts used to be made out of magnesium. In the old days, mag seat used to refer to the word magnesium, so it is merely a holdover from a bygone era. Flat seats were used on these lug nuts simply due to it being the most cost-effective option. Making a flat seat was a more economical choice and this made it easy for them to make the decision to go that route. The lug nuts wound up becoming among the most common types used. You will encounter mag seat lug nuts fairly often when working on cars and you shouldn’t ever have a problem using them. Flat seat lug nuts are a fairly common type of lug nut that you are sure to encounter at some point. They differ quite a bit from the other lug nuts being mentioned due to sitting on a flat seat. These types of lug nuts are going to sit flat against whatever they are installed on. This can make removing them a little trickier in some ways, as getting the proper amount of torque on these nuts will require a little bit of know how. There are similarities between the flat seat lug nuts and the mag seat lug nuts as well. Both of them are flat in nature and some people think of them as the same thing. Whether or not there is a substantial enough difference between mag seat lug nuts and flat seat lug nuts sort of depends on whom you ask. The basic difference that you need to understand is that flat seat lug nuts sit on flat seats that are like a washer and mag seat lug nuts have an extended thread with a flat seat. Sometimes, you will be able to use either a flat seat lug nut or a mag seat lug nut to accomplish the same thing. Working with a mag seat lug nut is going to be significantly simpler because you will be able to get better torque on the nut. You won’t have nearly as difficult of a time trying to install a mag seat lug nut. It isn’t that flat seat lug nuts are impossible to work with, it’s just that getting a grip on an extended thread is a lot simpler. The flat seat lug nuts being shown here are a pack containing 32 nuts in total. The lug nuts have a 14mm 2.00 thread pitch. You are meant to use a 21mm hex wrench to install these lug nuts, so be sure that you have the right tools before setting out. All of these lug nuts are just under an inch tall standing at 0.88”. Sometimes, it is going to be necessary to buy lug nuts that have an extended thread. There are actually many people that prefer to work with the extended thread lug nuts because it is easier to engage them. You are able to get a better grip on these lug nuts in some situations, and this can make your life a bit easier. When you are trying to ensure that lug nuts are installed properly, it can be good to have extended thread nuts when they are capable of being used. Sometimes, using extended thread lug nuts will not be an option. Even if they are the right size, something might not fit flush if you use the extended thread lug nuts. There will be plenty of situations where an extended thread lug nut is going to be preferable, but you will also encounter times where they won’t be usable. You need to be able to determine your needs on a project by project basis. When you purchase an extended thread lug nut, you will see that the thread sticks out more than usual. This allows you to grip it with your installation tool a little easier. Threading the lug nut and tightening it should feel a bit more natural than usual. There are going to be certain times where this will be very useful. You won’t have to use your torque wrench with quite as much finesse when you are dealing with an extended thread lug nut. You won’t have to worry nearly as much about breaking a lug nut when you have an extended thread lug nut. The extra torque that you are able to get when installing these is really nice. You’ll feel better about the installation process and will likely wind up preferring the extended thread lug nuts to the normal ones. Many people feel that working with these is significantly easier. The extended thread lug nuts being shown here are small diameter lug nuts. They have a 12mm by 1.5 thread size. 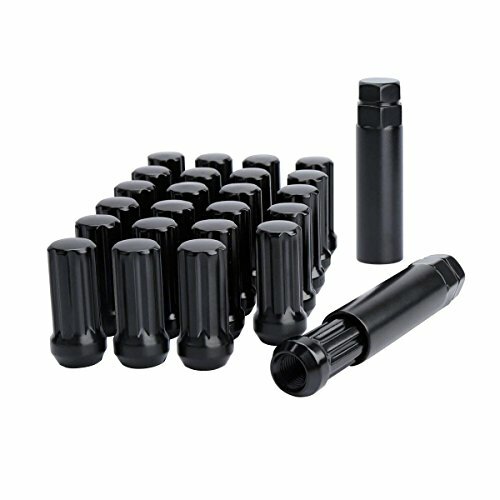 This is a pack of 20 lug nuts and will definitely be useful for your needs if this is the right size for your project. 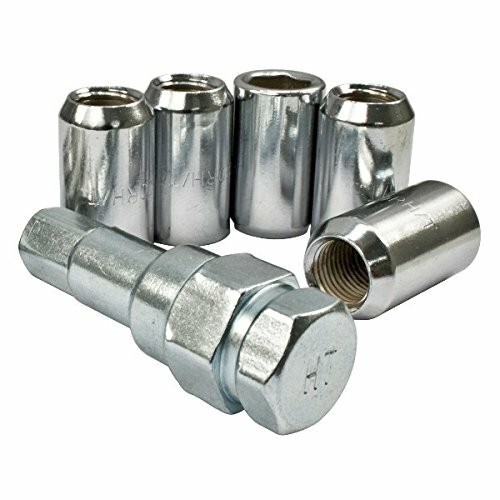 All of the lug nuts are forged out of durable chrome vanadium steel, ensuring that they will be able to stand up to regular use. Tuner style lug nuts are another type that has a conical seat. 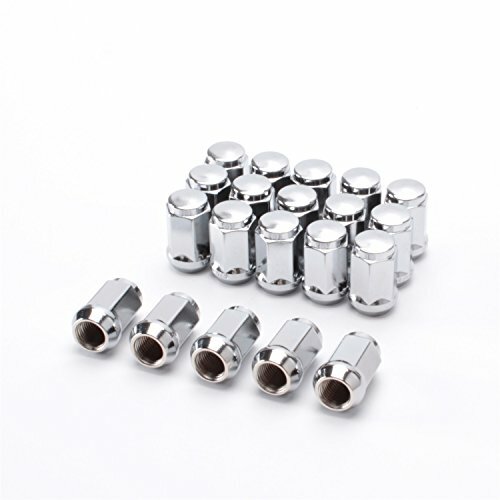 What makes these lug nuts stand out from the pack is that you will need a special key for them. Most of the time when you buy tuner style lug nuts, the key is going to come with them. The key is meant to be used on the outside when you’re removing the lug nuts. If the key doesn’t come with the tuner style lug nights, then you will be able to buy it separately. The key should be easy enough to identify, so you won’t have to fret. If you simply tell a clerk that you need a tuner style lug nut key, they are going to know exactly what you are talking about. You’ll be able to get what you need and you can then be on your way. 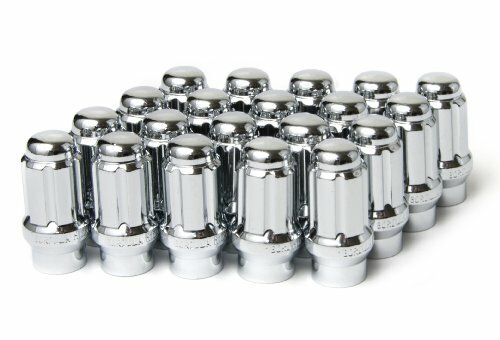 These tuner style lug nuts here are 1/2” chrome lug nuts. They are 60-degree taper tuner style, which is pretty typical for these types of lug nuts. The installation tool is included with these lug nuts, so you won’t have to worry about making a separate purchase. It really is the most convenient way to buy these when you don’t want to have to search around for multiple things. This is a five-pack of lug nuts, too. You will find that lug nuts usually come in packs of five or six. These are meant to be used with Gt-5 and BRM wheels that have a 5/112 lug pattern, but they can also be used for other purposes. This is an excellent set of lug nuts that will definitely live up to your standards of quality. You will encounter these types of lug nuts in many Chevy, Cadillac, and Ford vehicles. They are also commonly used on after-market wheels. Of course, there will be differences between these small diameter spline drive lug nuts depending on the size needs and other factors. Generally, these lug nuts have a conical seat with spline grooves and they use a special kind of key. The lug nuts being shown here are made out of cold-forged steel. There are 24 different pieces included in the set. All of the lug nuts have a seven spline drive close end. They will be perfect for helping you to complete your job on a car that requires these types of lug nuts. Using the keys on these lug nuts should be very easy. You’ll be able to fit everything in nicely so long as you have the right tools for the job. You should use a 13/16” or 7/8” hex wrench to finish up the job properly. 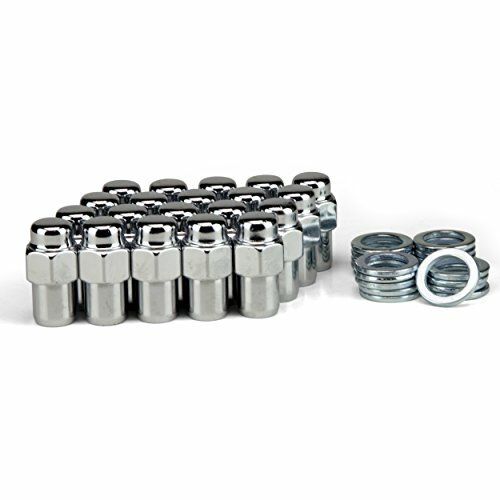 When you need small diameter spline drive lug nuts, these are going to work nicely for you. You may run into situations where you will need to use lug bolts on your vehicle. Sometimes a vehicle is going to have a flat rotor that doesn’t have any studs. If you have never encountered this before, then you may be left scratching your head for a minute. What you are supposed to do is use these lug bolts to secure everything. Lug bolts are basically a set of lug nuts that have the stud attached right to it. This is much more commonly seen in the European market, so if you are not familiar with their vehicles, then you may have never seen these before. Cars made in North America and in the Asian markets don’t use these lug bolts nearly as often. Regardless, it is good to know that these lug bolts are out there in case you want to purchase or restore a classic European vehicle. Needless to say, your lug bolts need to be the right size for the job that you are doing. If you try to install lug bolts that are too long, then you are going to run into problems accomplishing your task. Everything isn’t going to sit right and it just won’t go well at all. You always want to make sure that you are using the recommended size of lug bolt for the job. If you are restoring an old vehicle that uses lug bolts, then you should be able to look up information online to figure out the proper sizes. Information is more readily available now than it has ever been at any point in history. You will be able to find out exactly what you need to know, so there is no reason to use guesswork. Once you have the information that you need, you’ll be well on your way to finishing up your project. The lug bolts being shown here are simple steel lug bolts that measure in at ½ inch by 2¼ inch – 13in. It shouldn’t be hard at all to find lug bolts of varying sizes. Most of them are going to be made out of steel and you’ll be able to rely on them. They aren’t expensive either so it should always be easy enough to get what you need. Most lug nuts that are made are right-hand threaded. Obviously, this isn’t going to be as easy to find since they aren’t as common. For this reason, people often have to do a bit of searching to buy the left-hand threaded lug nuts that they need. They are not nearly as common and you may have a difficult time tracking down the right lug nuts, but it is possible. Some places do a better job of carrying left-hand threaded lug nuts than others. You may not be able to find the right lug nights that you need in every department store, but you should be able to find some in specialty hardware stores. Turning online to find the left-hand threaded lug nuts is an even better idea. This will allow you to order exactly what you need and you can ensure that you get the proper size. There aren’t too many vehicles that have lug nuts that are left-hand threaded, but they are out there. There are several types of motorcycles that make use of them and even some classic cars. You will be able to tell that a lug nut is meant to be left-hand threaded when it has an “L” or “LHT” stamped on the lug nut itself. It’s a good idea to buy the right lug nuts when you are swapping things out, especially if you want to keep everything original. There are also people who don’t bother with left-hand threaded lug nuts. Some people just simply put on a normal lug nut to replace one of the left-hand threaded ones and call it a day. It is up to you which route you will decide to take when dealing with this issue. It is simply important to know that these do exist and you can buy them, even if they aren’t quite so common. The example being shown off here is a left-hand threaded lug nut in the spherical style. It’s a very nice chrome lug nut that serves as an excellent example of a left-hand threaded lug nut. It may take a bit of extra digging to seek out lug nuts that are left-hand threaded and are the right size for your vehicle. With a little patience and some determination, you should be able to find what you need.